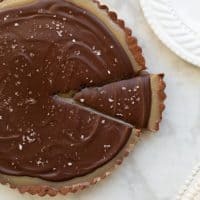 Gluten-Free Chocolate Caramel Tart! A decadent chocolate dessert that nobody will be able to tell is gluten-free! Made with a cookie crust, homemade soft caramel and rich chocolate ganache. The perfect special occasion dessert! This post is sponsored by Enjoy Life Foods. If you’re looking for a show-stopping, decadent, gluten-free dessert for a special occasion – look no further! 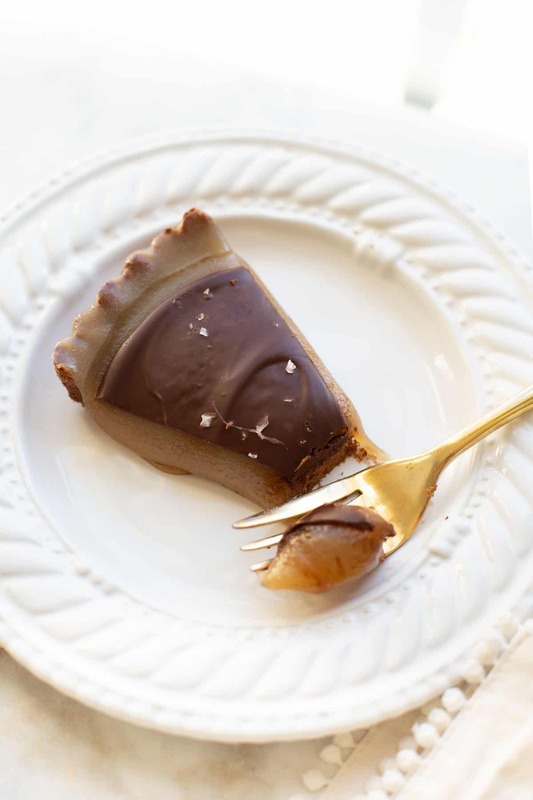 This Gluten-Free Chocolate Caramel Tart is a rich, chocolaty, caramel-lovers dream. The cookie crust is easy to make and undetectably gluten-free. This is the perfect make-ahead dessert for any gathering! 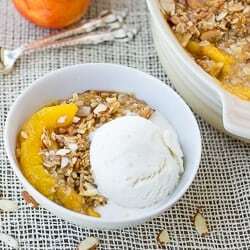 Just a note before you begin – you’ll need to plan in advance to make this dessert as it needs some time to sit in the fridge in-between steps. 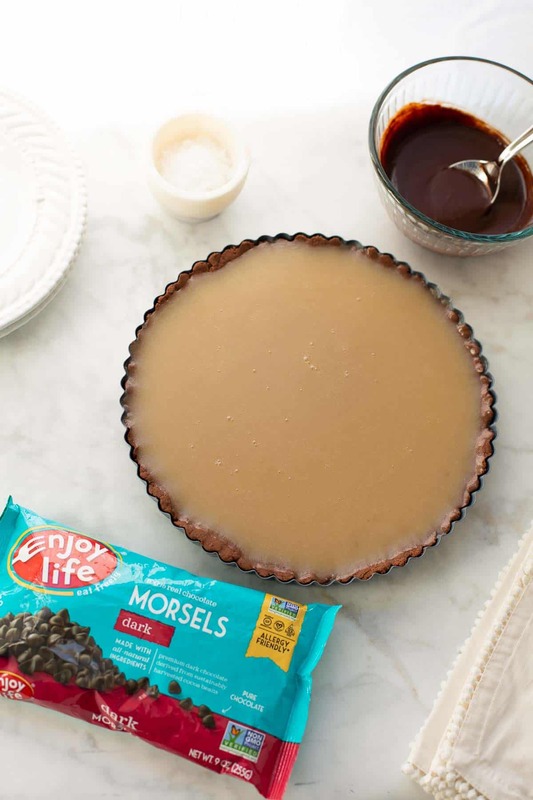 There are 3 steps to making this caramel tart. Bake the crust, make the caramel and spread on the ganache. Hears how you do it! Tip: Plan on making this Chocolate Caramel Tart a day in advance. The crust will hold up great and then you’ll definitely have enough time to let the caramel fully set before serving. 1. Make the Cookie Crust: Something I love about this dessert is that the crust is SO easy to make! You simply ingredients for the crust together then press it into the pan. No rolling required! I like using a tart pan with fluted edges to make this dessert extra fancy. Note: Don’t be alarmed if it look like it’s not enough dough! Start pressing the dough into the fluted edges then work inward. Once you make an even, thin layer it will be the perfect amount of dough. 2. 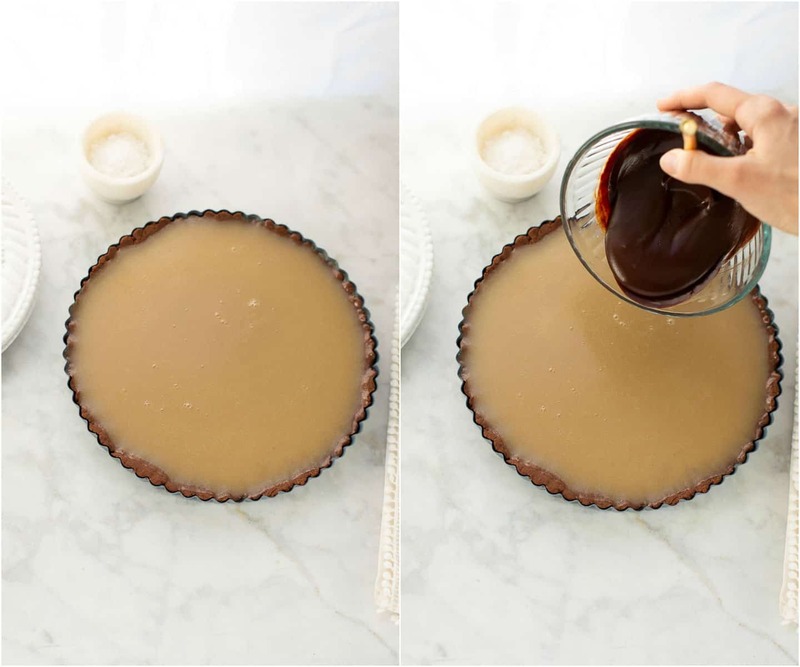 Make the Caramel: Another great thing about this Chocolate Caramel Tart recipe is you don’t need a candy thermometer to make the caramel filling. You make the caramel by letting the sugar mixture boil for 10-12 minutes until it turns a dark amber color. Then you quickly whisk in all the creamy ingredients (butter, heavy cream) and pour the caramel into the pan. The only thing to be sure of is to let the bubbling sugar mixture get dark enough before mixing in the other ingredients. It should look golden brown but not overly dark. Tip: Have the butter, heavy cream and vanilla measured and ready to go before you start making the caramel. They will be needed quickly after the sugar mixture reaches the right temperature. 3. Make the Ganache: After the caramel has set in the fridge you make a simple ganache to spread over the top – yum! The ganache is made with Enjoy Life Foods Dark Chocolate Morsels and heavy cream. I like to finish the tart with a sprinkle of fleur de sel to give it the perfect balance of sweet and salty. 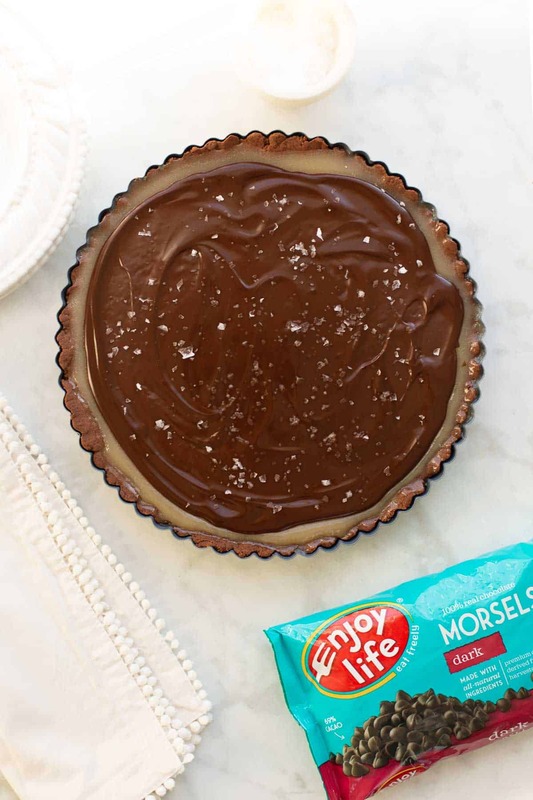 A 9-inch nonstick tart pan is easy to use and makes a gorgeous tart. 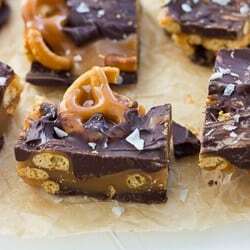 No candy thermometer needed for this recipe! Just keep an eye on the sugar mixture when you’re making the caramel and wait for it to turn a deep amber color before adding the cream/butter. A high-quality chocolate makes a decadent ganache topping. 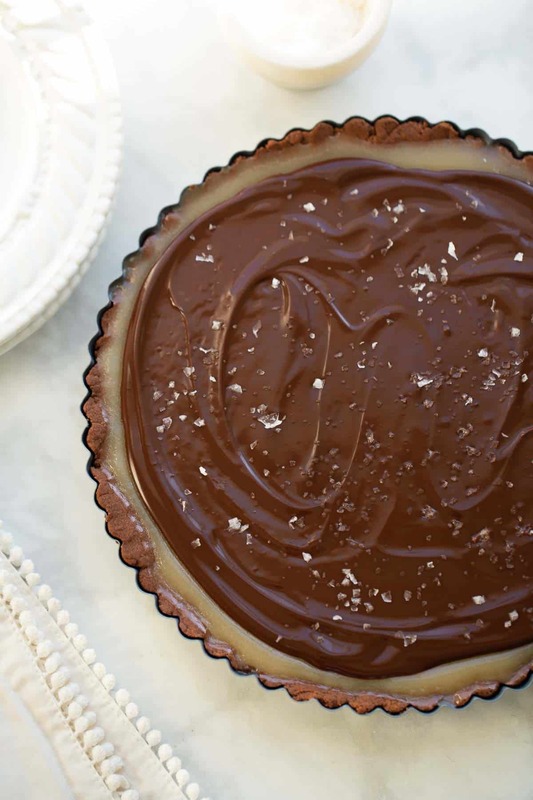 A spinkle of fleur de sel gives this tart a gourmet finish and the perfect hint of salt. A decadent chocolate dessert that nobody will be able to tell is gluten-free! Made with a cookie crust, homemade soft caramel and rich chocolate ganache. The perfect special occasion dessert! 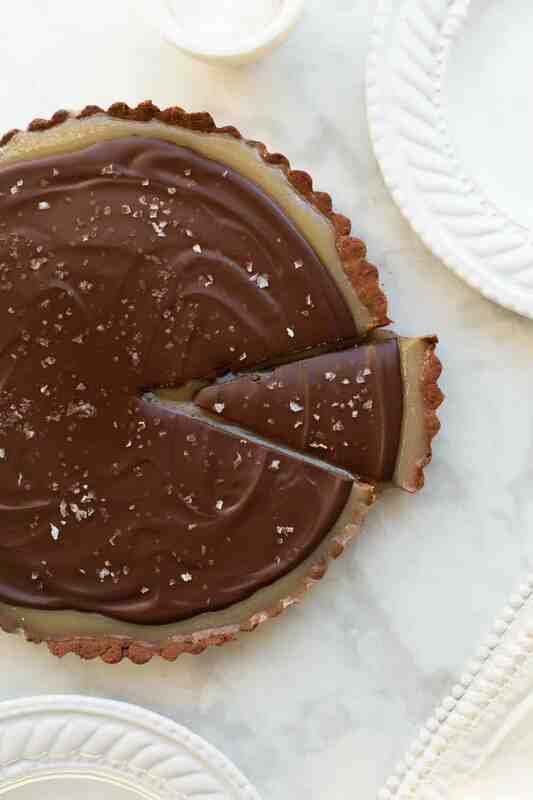 Plan on making this Chocolate Caramel Tart a day in advance. The crust will hold up great and then you’ll definitely have enough time to let the caramel fully set before serving. Preheat the oven to 350F. Lightly grease a 9-inch tart pan (a 9-inch pie plate will also work) with cooking spray. In a medium bowl, combine all the ingredients for the crust. Mix using a hand or stand mixer until completely combined. Press the dough into the sides and bottom of the tart pan. It will look like it’s not enough dough, but once you make an even, thin layer it will be the perfect amount of dough. 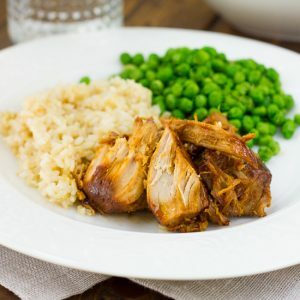 Place on a baking sheet and bake for 20-24 minutes. Remove from the oven and let cool. Have the butter, heavy cream and vanilla measured and ready to go. They will be needed quickly after the sugar mixture reaches the right temperature. In a heavy-bottomed medium saucepan (pick one with high sides so the mixture doesn’t boil over), combine the sugar, water and corn syrup. Bring the mixture to a simmer over medium heat. Cook for 10-12 minutes, until the mixture is a dark golden/amber color, tilting the pan just slightly every couple of minutes to swirl the mixture. Do not stop early when it is just a light brown color. Wait for the amber color and avoiding stirring so the sugar mixture doesn’t go up the sides of the pot. Immediately add the butter, heavy cream and vanilla extract. The mixture will boil and bubble vigorously. Stir to combine everything until smooth then immediately pour into the prepared crust. Transfer the tart to the refrigerator and let cool until the caramel has set, at least 2 hours. Heat the cream in a microwave-safe dish until just simmering. Pour over the Enjoy Life Foods Chocolate Morsels and stir until smooth. 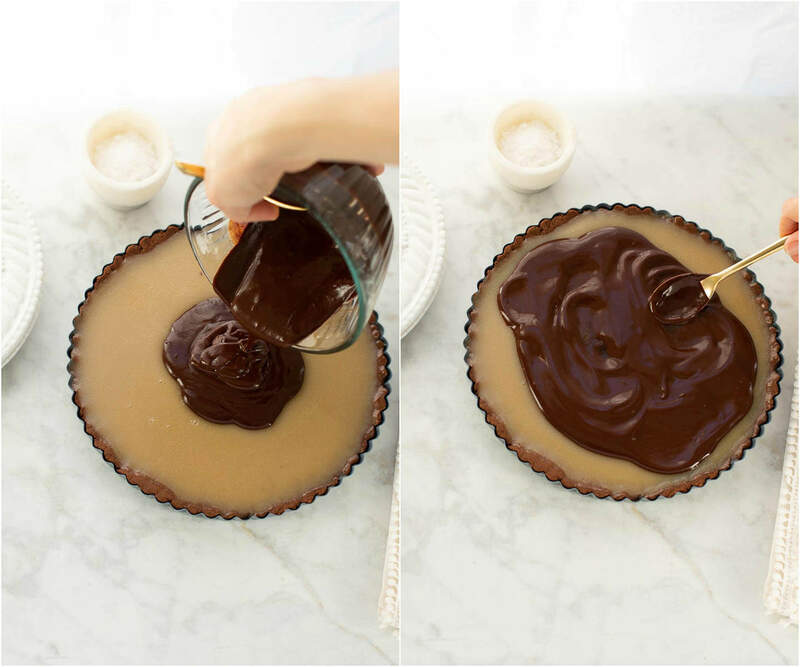 Spread the chocolate over the cooled tart. Sprinkle with salt then return to the refrigerator for the ganache to set. Slice and enjoy! Keep refrigerated in between serving. Tart can easily be made a day in advance. Enjoy!